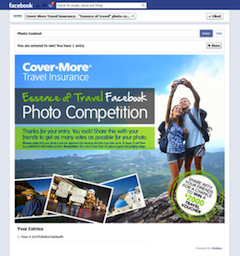 Tag Archives for " Facebook contests "
10	Running Promotions on Facebook Just Got Easier or Did It? Facebook recently changed the long standing policy that required page owners to use 3rd party apps to run contest and sweepstake type promotions. The fact is that while running contests directly on the wall was a violation, Facebook didn’t seem to police this and many people abused it. So the change simply makes it legal. This change in the terms will likely launch an onslaught of contests right there front and center on the wall but I’m not so sure it should. I think Facebook promotions can be very powerful for just about any type of business in terms of generating attention and even leads when done right, but most wall type promotions I’ve seen are poorly done and don’t generate much but a bunch of meaningless likes. To run an effective promotion on Facebook I contend that tools like Shortstack, Woobox and Offerpop have a lot to offer over the self run wall contest. Below are a couple reason why I believe Facebook contests should still be deployed with an app. The apps mentioned above all allow you to create branded graphics to go along with your promotion pages (description, entry form and sharing dialogs) and make it much easier to keep your promotion in sync with your brand. Now that all comers can run wall based contests I’m betting you’ll see some poorly thought out spammy looking promotions that may make this type of promotion less than appealing to businesses wanting to stand out. Finally, and for me this is the biggie, in order to make your promotions pay you should be collecting the email addresses of participants rather than attracting random likes. Obviously this means you’ll get fewer participants and that your contest must be more compelling, but email capture tools, sharing and engagement built into apps assure that if you run a great contest you’ll have more to show for it with the ability to continue to communicate with participants after the fact. Considering a promotion on Facebook? Take a good look at an app to run it all.